1960s New Wave cinema certainly loved the emerging ideal of a modern “it” girl and the travails she suffered on the way to adulthood, as the swinging lifestyle revealed perhaps how the cultural revolution had not necessarily turned as far as it could have (or should have). 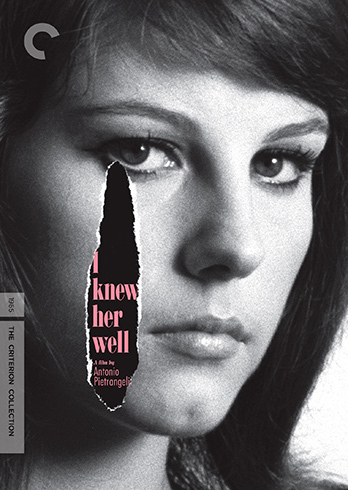 Joining the titular actress in Varda’s Cleo From 5 to 7 and Goya in Godard’s Masculin feminin, Stefania Sandrelli’s Adriana from I Knew Her Well is another young lady whose liberation comes with consequences, whose choices don’t always add up, and yet who deserves more. She charms the audience more than perhaps she charms the predatory men who promise her access to bigger and better things. So much so, she often looks directly at us, a knowing look in her eye, self-reflective, daring her observers to judge her harshly or, at least, with a greater moral authority than she already judges herself. Released in 1965 and both directed and co-written by Antonio Pietrangeli (The Visitor [review]), I Knew Her Well is a portrayal of a segment of time, though it is itself unconcerned with time’s exactness. In terms of narrative, the hours and days are immaterial. We move from episode to episode with little orientation. There are breathers here and there, such as when Adriana leaves Rome to visit her family in the country--our only real hint of her origin--but otherwise we are caught up in her beguiling endeavors. She goes from party to party, man to man, auditioning for modeling jobs and for paramours, finding a laugh in almost everything, attracted to life and the people in it as much as they are generally attracted to her. All set to a pop music soundtrack, an early use of a contemporary tunes to drive the story, the jaunty ballads acting as a kind of Greek chorus, the way they do so often in life. Adriana’s goals seem simple, and also relevant. For lack of a better description, she wants to be famous, and if she can’t pull that, she wants to at least have a good time. There are steps to this. When we first meet her, she is working in a beauty parlor in a seaside town, saving money to buy some publicity. The girl manages to travel a lot, and she manages to get herself to the right parties. Pietrangeli and his director of photography, Armando Nannuzzi (Mafioso [review]), follow her, observing how she acts in the different locations. She makes eyes at a movie star, dances with a musician, stomps away from her lecherous agent, the would-be pimp that he is. The camera doesn’t keep a consistent distance, but there are noticeable visual shifts. Those aforementioned close-ups come at more emotional junctures, an implied intimacy with the audience. At other times, our own lustful gaze turns to melancholy and pity, as Adriana turns away from us, lounging mournfully during bouts of loneliness or regret. But then, one might also consider that she turns away from herself. In one striking scene, both sides of Adriana’s life are encapsulated in one relationship. She is on holiday with a writer (Joachim Fuchsberger), a fussy individual who is his own unique character. Tellingly, this man won’t dance or swim, and he refuses to let Adriana listen to the radio. He’s no fun, but his stiffness forces introspection. He belittles and rebukes her, and then makes up with her quickly, psychologically diagnosing her as someone who is constantly seeking the companionship of others to avoid having to be herself. He ends by saying this may make her “the wisest of all,” and he’s not exactly wrong. If Adriana were alive today, she’d have a hell of an Instagram account. And probably a similar list of terrible lovers. She is the target of carnivorous husbands and bosses, leering old men and groping boys, opportunistic publicists and agents, con artists and thieves. The only sweet and genuine person she encounters is the one who isn’t an intellectual--the unsuccessful boxer Lunk (Mario Adorf, The Lost Honor of Katharina Blum [review]), whom she meets briefly, has an honest exchange with, and then abandons. She doesn’t see the effect she has on him, but we do. It’s a sweet scene, but also illuminating. From it, we can extrapolate just how much better it would be for Adriana if she realized how wonderful she can be when all pretense is gone. There is no pretense in Sandrelli’s performance. The actress, who can also be seen in the Pietro Germi films in the Criterion Collection, is a natural presence on screen. She is effortlessly alluring, inviting the audience to watch, revealing her inner character through glances and gestures, particularly the ones that play against what she may be saying or doing. She was born to be a star. Though narratively I Knew Her Well brings to mind the aforementioned Godard and Varda efforts, in terms of setting, the Italian film draws earned comparisons to its country-fellow, Fellini’s La dolce vita [review], particularly for its depiction of life in Rome at the time. Though Adriana is several steps down in status from the movie stars and players of that earlier effort, we know that Marcello and Sylvia are out there somewhere on the periphery. Too bad they couldn’t take Adriana under their wings and teach her how to deal with the hangover of all this excess a little bit more; then maybe I Knew Her Well wouldn’t have such a shocking ending. Its tragic nature is strangely unsettling, and ends up being hard to shake, nearly blotting out the humor and the joy that marked so much more of the film. I Knew Her Well is sumptuous and seductive. Though it seems long forgotten, this hidden gem of mid-60s cinema has been unearthed at last. It is as bright and dazzling a bauble as you’re likely to find, but also provocative and daunting. It twinkles with story. Don’t hesitate to seek it out. The disc was provided by the Criterion Collection for purposes of review.